What Do You Do with Leftover Wine? This is a subject very near and dear to my heart. Even though I make my living making wine and being surrounded by the alcohol industry, I am not a particularly frequent drinker. I’ll have 2-3 glasses per week with only one of those typically being on a week night. Most people are surprised by this. However, this usually means that I have partial bottles that are open when my husband and I get the urge to open something. Then we are torn as to what to do with the leftover wine. Inevitably whenever someone brings this question up the industry jokes follow. Let’s face it. From a health perspective, unless we have 3-4 people with whom we are sharing the wine a typical bottle should last more than one day. This is something that is an issue for our industry but so often it gets swept under the rug and having “leftover wine” is something that is ridiculed and laughed at. So here we go. 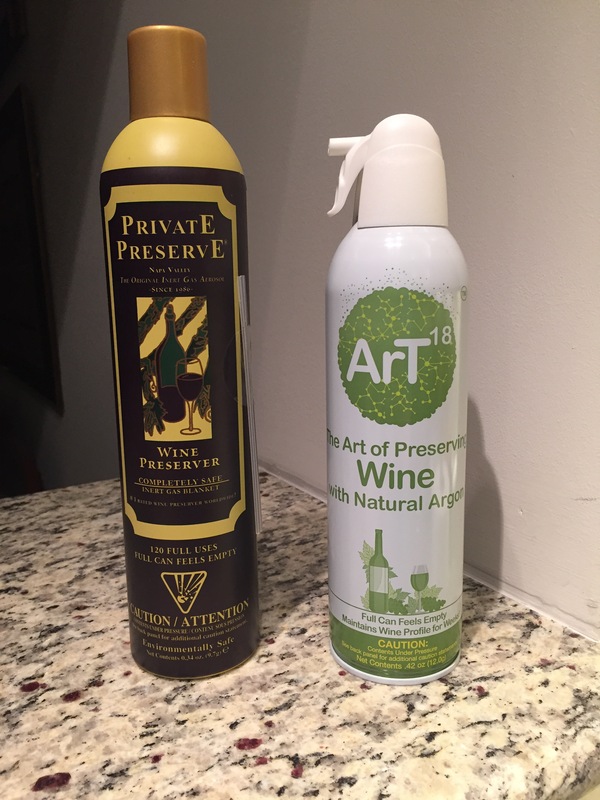 Here are two options for wine lovers who want to open those special bottles but don’t want to worry about finishing it before the inevitable exposure to oxygen starts to degrade the wine. The first is called Private Preserve (Buy it here on Amazon.com). This is one I’ve used for years and is a mix of CO2, Nitrogen, and Argon, three gasses which are very common in wineries. It is a must have for making white wines at home in carboys and really works well for keeping wines that have been opened from going bad. I purchased the bottle in this photo two years ago. To tested both head to head I had the perfect opportunity when I hosted several fellow MW students who wanted to work on their Practical Exam skills. I put 3 full mock exams together (36 wines total) ranging from $6.00 per bottle to close to $200.00. We gassed each of the wines after the exams with one of the two products. The mock exam weekend was about a month ago and I have been slowly opening the bottles to try them over the past month. Long story short, both work really well. Even this evening, after a month a half full bottle of 2010 Haut Medoc was fresh and very drinkable. The one wine that did not do well under the preserving gas was a 2003 Gevrey-Chambertin 1er Cru. Admittedly this one tasted a bit ov er the hill when it was just opened but after two days under the gas it had started growing a film yeast like coating and going very south flavor wise. Even the floral white wines which stayed under gas and open in our fridge for 2 weeks were still fresh and drinkable. The reds we left on our counter with the corks stuck in the bottles and continued to sample them and then re-gas over the past month. In conclusion, we should never feel like we need to finish a bottle of wine in one sitting just so it doesn’t go to waste. With these two home gassing methods, wines can stay fresh for a long period of time and you never have to worry about opening too many bottles to try.